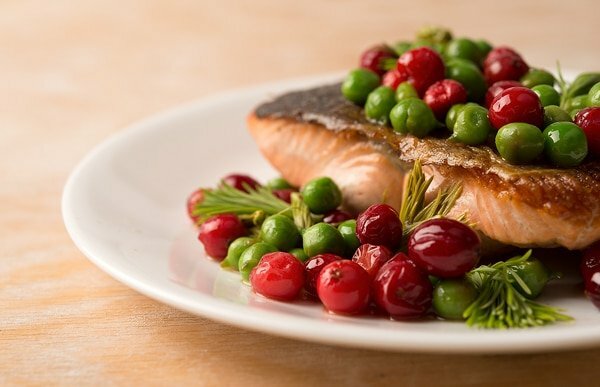 Salmon, served with peas, cranberries and spruce tips. If you think this dish looks like Christmas on a plate, you’d be right. But if you think you can make it at Christmastime, you’d be dead wrong. As crazy as it might sound, this dish can really only be made in spring. First off, you really can’t get fresh wild salmon in December. Ditto for peas, although frozen peas are almost as good. As for the cranberries, totally in season for Christmas, right? Sorta. But not. These, you see, are not just cranberries: They are vattlingon, fermented cranberries. They require several months in a Mason jar before they’re ready… right in time for early spring. And the young, growing tips of spruce or fir trees are of course a hallmark of springtime wherever these trees can be found. How on earth did I come up with this crazy dish? It came out of a casual conversation with one Swede, an idea from another Swede, and a similar recipe I learned from a Dane. The combination of cranberries and spruce tips I picked up from Danish Chef Rene Redzepi’s cookbook Noma: Time and Place in Nordic Cuisine. The idea for the vattlingon I got from Swedish Chef Magnnus Nilsson’s cookbook Fäviken; Nilsson of course uses lingonberries, but I used wild cranberries from New England. Finally, I was discussing vattlingon with Swede Staffan Terje, chef and owner of San Francisco’s Perbacco, when he suggested that the fermented berries might go well with salmon. The vattlingon wasn’t the only waiting game involved in this recipe. The salmon, a spring king from the Willamette River in Oregon, was also a long time coming. A couple weeks ago, I went up to Portland with my friend Joe to fish with his brother Paul and their friends Bruce and Aaron. The spring chinook bite was supposed to be on, and we wanted in on it. 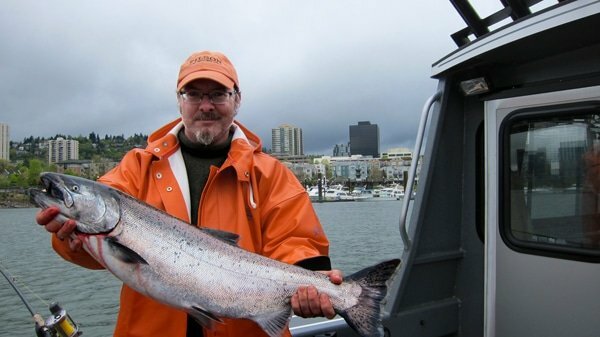 Why a 600-mile drive for salmon? Because spring-run fish are the best-eating salmon of the entire year. Clean-tasting, fat and lurid orange from all the krill they’d been eating. Beats a fall fish hands down. We mostly fished in downtown Portland, which was kinda cool. Wild fish, urban setting. I like juxtaposition. Unfortunately the bite was cooler than the weather, which was — as you might expect in Portland — cool and rainy. Hour after hour we trolled up and down the river, marking hundreds of fish on the sonar. But in 26 hours on the water, Joe and I only caught four fish between us; I only got one. It is a nice fish, though, eh? After smoking the bellies and collars, this Swedish dish was the first thing I made with my first chinook of 2013. The combination really, really works. King salmon is of course fatty, and I cooked everything in butter, too. Peas and butter are a natural. Young spruce (or Douglas fir) tips are not resinous — they are citrusy and only slightly bitter, far less so than arugula. But its the vattlingon that makes the dish. To make it, you simply wash some fresh cranberries and submerge them in clean water in a glass jar. Put them in the fridge and leave them for several months. No salt, no sugar, no vinegar. Cranberries (and lingonberries) contain benzoic acid, which is a natural preservative. The effect is to mellow the extreme tartness and tannins in fresh cranberries, leaving them pleasantly acidic and slightly sweet. Wonderful stuff! The whole dish becomes a party: Crispy salmon skin, luxurious, rich salmon meat, tart cranberries, citrusy, soft spruce tips and homey spring peas. Sweet butter ties it all together. Spruce tips are popping right now, so I urge you to give this recipe a go — even if you don’t have a stash of fermented cranberries on hand. ]OK, so I know the first thing you're going to say: "Dude, I don't have vattlingon or whatever you call them." Don't worry about it. Yes, this dish is better with them. But you can substitute fresh or frozen cranberries, too. Almost as good. No access to cranberries at all? Use some unripe other berries, such as half-ripe huckleberries, gooseberries, currants, blueberries or even blackberries, mulberries or raspberries. The point is slightly sweet and very tart. No spruce tips? Squirt a little lemon juice on the plate and use about 1 tablespoon fresh chopped rosemary. Not the same, but will give you that piney acidity you want. The rest should be easy. Salt the salmon fillets well and set them out at room temperature for 10 minutes. Heat 3 tablespoons butter over medium-high heat in a saute pan large enough to fit all the salmon pieces. Pat the salmon dry with paper towels and lay skin side down (even if there is no longer any skin on the fish) into the hot butter. Let this sizzle like you'd sizzle bacon; the sound should be about the same. Let the fish cook for 2 minutes undisturbed. Now use a spoon to baste the fish all over. This will cook it perfectly, leaving the center a nice medium. Keep basting for at least 90 seconds, and up to 3 minutes if you have a very thick piece of fish. For a typical piece of king salmon, 2 minutes is about right. Leave the salmon cooking for 1 to 2 more minutes, until the skin side is very crispy. Move the salmon to a cutting board to rest, skin side up. Add the remaining tablespoon of butter and the peas. Cook for 1 minute. Add the cranberries and cook for 1 more minute. Toss to combine, turn off the heat and add the spruce tips. 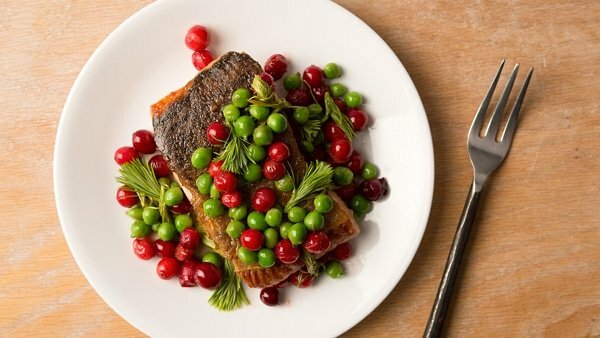 Put a piece of salmon on everyone's plate, pour over the pea-cranberry mixture and grind a little black pepper over it all. Serve at once. Serve this with crusty bread or some sort of potato; roasted fingerling potatoes would be my choice. [summary]OK, so I know the first thing you’re going to say: “Dude, I don’t have vattlingon or whatever you call them.” Don’t worry about it. Yes, this dish is better with them. But you can substitute fresh or frozen cranberries, too. Almost as good. No access to cranberries at all? Use some unripe other berries, such as half-ripe huckleberries, gooseberries, currants, blueberries or even blackberries, mulberries or raspberries. The point is slightly sweet and very tart. No spruce tips? Squirt a little lemon juice on the plate and use about 1 tablespoon fresh chopped rosemary. Not the same, but will give you that piney acidity you want. The rest should be easy. Heat 3 tablespoons butter over medium-high heat in a saute pan large enough to fit all the salmon pieces. Pat the salmon dry with paper towels and lay skin side down (even if there is no longer any skin on the fish) into the hot butter. Let this sizzle like you’d sizzle bacon; the sound should be about the same. Let the fish cook for 2 minutes undisturbed. Add the remaining tablespoon of butter and the peas. Cook for 1 minute. Add the cranberries and cook for 1 more minute. Toss to combine, turn off the heat and add the spruce tips. Put a piece of salmon on everyone’s plate, pour over the pea-cranberry mixture and grind a little black pepper over it all. Serve at once. Fascinating info on the cranberries! And gorgeous dish for sure. I can never have enough salmon dishes. And, yes, HUGE CONGRATS on winning the James Beard Award for best individual food blog! So well deserved, Hank! You are and always will be the direction we need to be looking and living in. Such an elegantly simple recipe. It’s on our table tonight!